← Quiz: What magical creature are you? The back story: I was studying, taking a course called Writing Children’s Literature. I had a long reading list of children’s books, so I began buying some from the bookstore and borrowing many from the library to read from that list. One day I made a trip to the bookstore and just wandered around lovingly looking at and touching the many, many books, when I came upon this particular one. 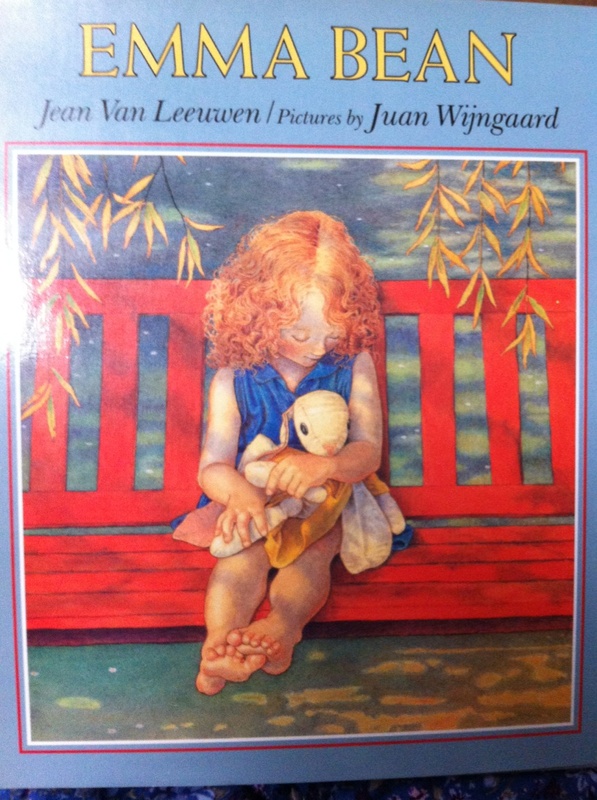 Emma Bean by Jean Van Leeuwen was the most gorgeous hard cover book I had seen that day … and maybe ever up to then. I stood in a quiet aisle of that bookstore and read the story. Oh my goodness! It so touched my heart it was all I could do to keep from crying right there. In fact, I think I did sniffle a little. Not prepared to buy anything that day I reluctantly put the book back, but a few days later I went to the little shop with a specific purchase in mind and left with my own copy of Emma Bean. 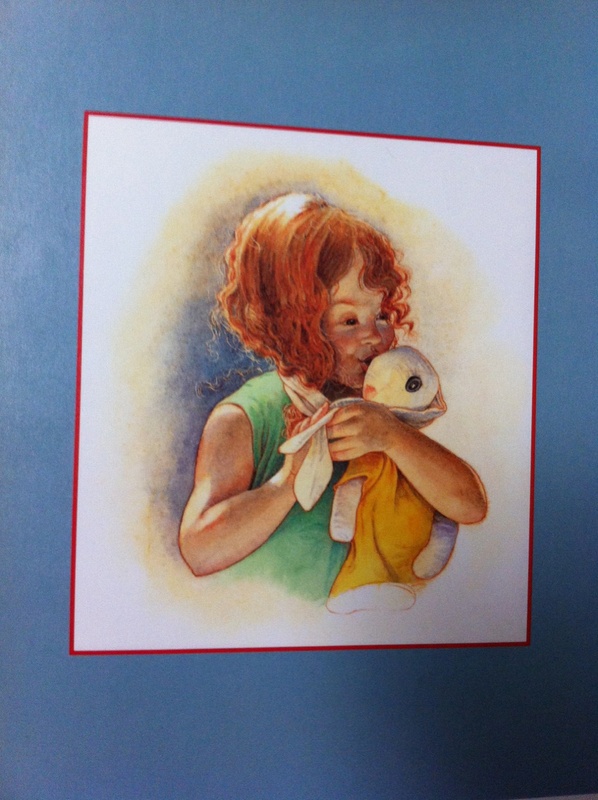 Look at the words of the opening page: Once there was a rabbit and she had a girl. The girl’s name was Molly. The rabbit was Emma Bean. How sweet and inviting is that beginning? This is the most adorable story. Emma Bean was made to be a cuddly toy bunny for a baby, and as the little girl grew Emma Bean got to have lots of experiences – from taste-testing to ‘flying’ (not always the best fun) to going to school. The illustrations by Juan Wijngaard are fabulous. Rich, colourful, realistic, they help to make the story delightful and memorable. You can find Emma Bean listed on my BUY THE BOOK! page. This entry was posted in Mostly About Reading, Reviews & Interviews and tagged baby's toy, beautiful storybook, Book review, Dial Books, Emma Jean, fabulous illustrations, Jean Van Leeuwen, Juan Wijngaard, loved toy, Picture book, rabbit toy. Bookmark the permalink. Will look for this book for my granddaughter. It does seem magical both in its illustrations and writing. Thanks, Lynn. You’re welcome, Syr. I hope you can find a copy; I’m sure she’ll love it. I love books like this. I know a little person who would enjoy it. Thanks for the great review. So do I! I’m sure your little person would enjoy it. Thanks, Darlene.